Strad Solutions Review 2019: Is Strad Solutions a Good Hosting? Indian company Strad Solutions offers enterprise-level hosting plans. Backups cost extra, but don’t let this dissuade you from checking out its feature-packed packages delivered from multiple Tier III and Tier IV data centers. Established in 2013, Strad Solutions is an Indian hosting business with its own Tier III data center and more than 2000 customers. It doesn’t offer shared hosting but does let you choose between VPS, dedicated server, and colocation plans. The Strad Solutions website and support are available in English. Strad Solutions houses servers in its own Tier III data center in Mumbai, in a Tier III center in Seattle, and in a Tier IV center in Texas. It’s good that this provider owns its own data center (for quicker response times to technical issues) and that, otherwise, it colocates in Tier III and Tier IV data centers, which – in the latter case – should ensure less than 26 minutes of downtime per year. It’s unsurprising that you get a good 99.95% network uptime SLA. You can choose between Windows, Linux, or cloud VPS plans. The Linux plans come with support for Magento, MySQL, cPanel, Cloud Linux, and SSL. The Windows plans support Microsoft SQL (for an additional fee) and come with the Plesk control panel. You get the usual phpMyAdmin and FTP, plus SSH access and root access on Linux. You can choose cheaper, slower HHD, or (for an additional fee) select super-fast SSD storage in RAID 10 configuration. At the checkout, you can customize the base plans by adding RAM, storage, IP addresses, and backup options. 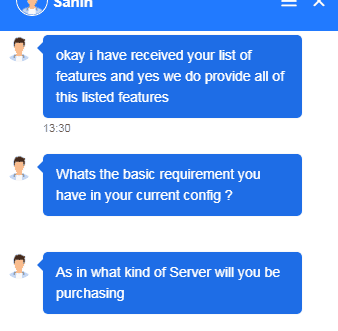 So overall, the very flexible packages can be configured to meet a wide range of requirements. The feature-packed plans are very well priced, especially since the servers are located in Tier III and Tier IV data centers. Plans can be purchased on terms from one month to one year, with a decent discount for making an annual commitment. However, there is a strict “no refund” policy, so you’d need to be pretty confident about signing up for a year. Keep in mind that customizations will increase the monthly cost, and you’ll have to pay extra for an SSL certificate and domain name. One minor bugbear is that backups also cost extra. The 24/7 technical support team can be contacted by phone, email, or live chat, and there is a substantial self-support help center with lots of articles. India-based Strad Solutions offers customers a great range of options; from Windows to Linux, from HDD to SSD. But budget-conscious customers should beware the extra cost of customizations. Buy premium hosting from Strad Solutions! 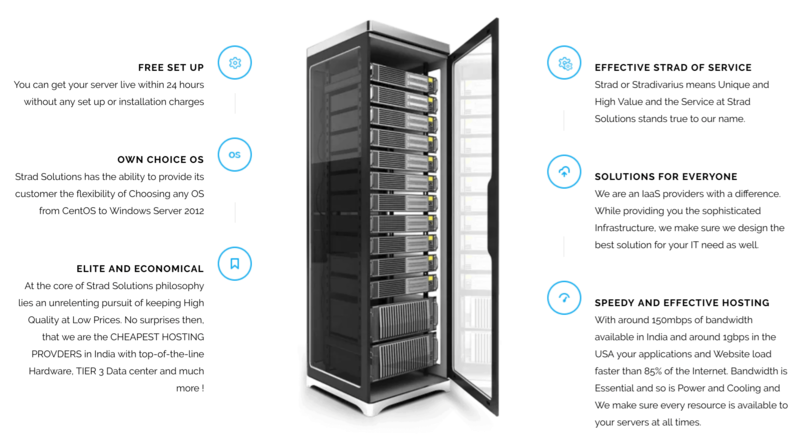 Wondering how Strad Solutions stacks up against other Web Hosting companies? Enter any other Web Hosting company and we will give you a side-by-side comparison.